Intuitive drag-n-drop behavior gives the possibility to change events date and start/end time by simply dragging the event boxes. The calendar events can be displayed in Day/Week/Month views. You can also use your own server-side code written in any language (PHP, Java, ASP, etc.) to bind scheduler content to the database. dhtmlxScheduler is distributed under GNU GPL and commercial licenses. This is really a cool control but i think that you need to buy it in order to be able to use it in a website you are selling right ? That’s the best schedule thingymaboper I’ve seen! Including desktop ones. This is superb! The non-profit version is nice to play with, but if you need to include this in a commercial product $99 is not a bad deal at all! Considering it works well and you get updates. It is a nice scheduler. 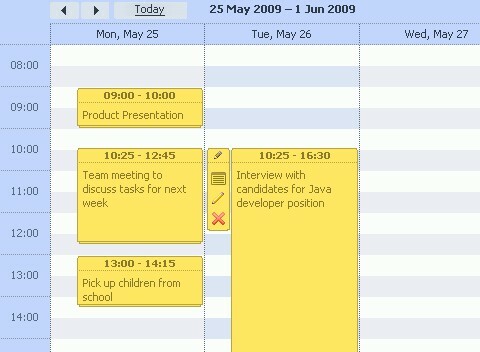 When we evaluated different schedulers for our product, web2calendar was the easiest to implement. Best part I liked was creating templates in plain HTML and it fitted any kind of objects. Yes, their documentation is not upto mark but their support is good. You do not need to buy it in order to use in a website you’re selling. You can use it under GNU GPL Licence, which , in short, means your web-app needs to be delivered/published in a GNU GPL as well. Which is: open source. So then , anyone can use it. I think, it only really regards to patent affairs. You cannot sell it (such app) as a closed product to which you have exclusive rights. On the other hand – if you buy the commercial version, you can do the above! I might come to far for sake of simplicity, so If you think I’m not being precise and strict please, correct me.